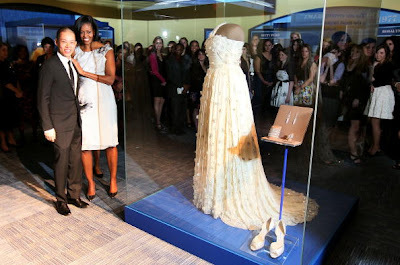 Michele Obama and Jason Wu unveiled the dress she wore at the inaugural ball in a ceremony at The Smithsonian this morning. Since I've met Jason Wu twice, this has me one degree removed from the first lady and two degrees separated from her husband. He's a man I'm still proud to say I voted for by the way. So congratulations Jason, it's a real thrill to see such talent succeed. was kind of exciting to see Jason there with the First Lady! And, wow, what an accomplishment for someone so young! I am not sure I even paid my bills on time when I was his age....or paid them at all??? Tell me about it. I was a mess at 26. A hot mess.